have i told you about my love–hate relationship with facebook? That’s how I feel about Facebook, every day of my life. I don’t know if I can take another algorithm change. 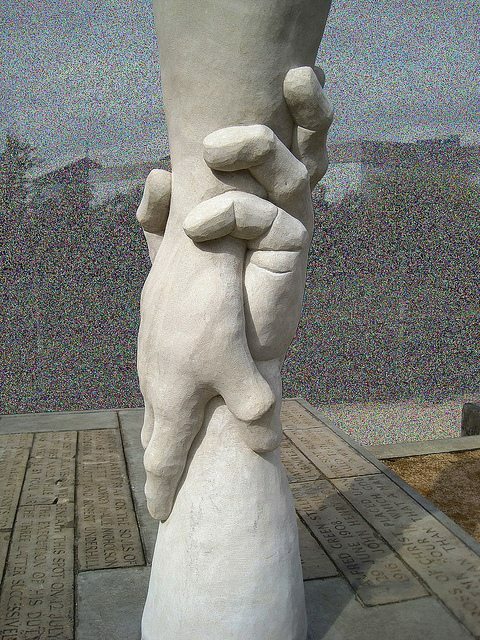 And it seems like the wounds from the last one haven’t even healed yet when another comes along and rips in even more. Sometimes I don’t think I’ll ever recover, and walking away seems to be the best option. But then I look at the data. Facebook is one of the top drivers of traffic to my websites, second only to Google. And the quality of the traffic coming from Facebook has been much more engaged than other sources, making it probably the single most valuable referrer of people checking out my work. So are all the headaches worth it? Well, it depends. I read somewhere recently that all the algorithm changes aren’t a reason to jump ship right away, that is unless your strategy is a shallow one. 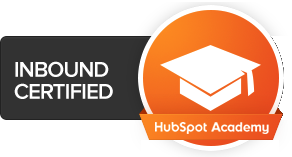 The article pointed out that the opportunity is still great for smart marketers. 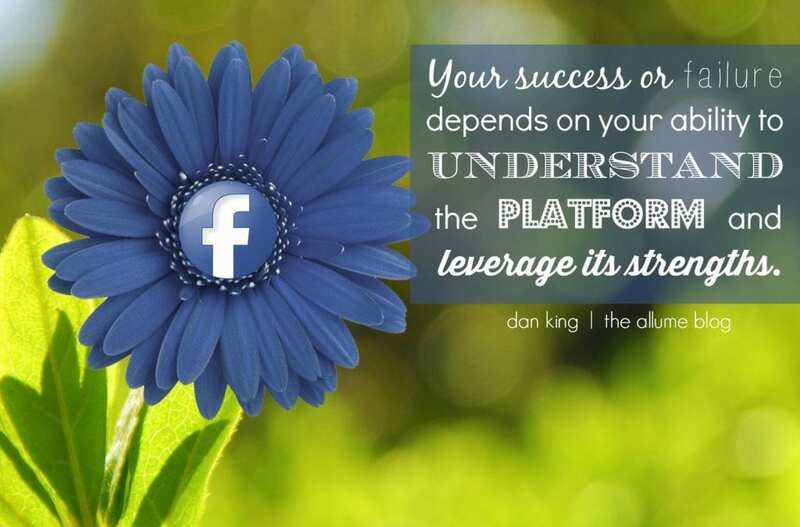 Success or failure depends on your ability to understand the platform and leverage its strengths. It’s not about tricking the system or developing elaborate systems to make it do what you want. Facebook is about people. It sounds simple, but we quickly forget as we try to focus on numbers for reach, likes, shares, and comments. When we post something, we want it to be seen by as many people as possible. But the second we start thinking about numbers, we start to lose sight of people. Many feel like Facebook’s attempts to limit the visibility of brand page content is merely an attempt to force people to pay for views. While there may be an element of truth to that, think about what your news feed would look like if brands weren’t limited in any way. It would be overflowing with “commercials” from brands trying to get you to buy something. And I don’t know anyone who gets on Facebook to sort through a steady stream of advertising hell. And Facebook is more likely to keep people on the platform when it can keep the focus on people. No lie. This is one of the most frequently asked questions I get when I talk to people about social media. With all of the talk about Facebook pushing down the reach of pages (unless you pay-to-play), it’s difficult to see a brand page adding value. At the same time, many book publishers look for fan page numbers as evidence of an author’s platform. Ultimately, a brand page can add value… as long as you understand it’s strengths and limitations. 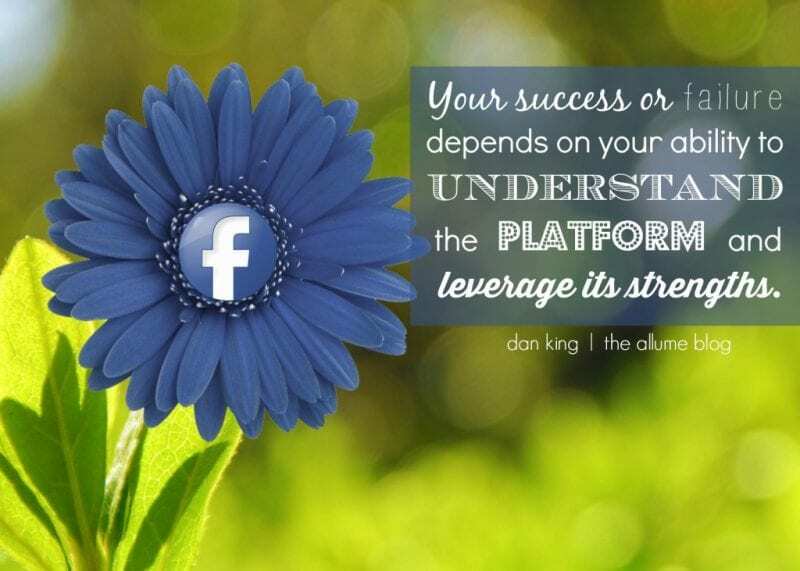 But the greatest traction you get on Facebook will come when you post to your personal profile. I recently did an informal study of engagement on some brand pages. One of the pages I looked at is an author page belonging to a popular New York Times Best Seller. Averaging 1,383 likes per post, there’s enough engagement to make the best of us covet our neighbor’s social media platform. But then consider that this person’s page has over 146,000 followers. The average engagement rate turns out to be only 0.9% of the total fan base. And that’s actually a good rate of engagement! Remember, the platform is about people. So any successful strategy should be centered on how you use your personal profile to get the better reach. In another informal study, I’ve posted new content to my brand pages and watched the rate of engagement for the first few hours. Often my efforts make me feel like I’m watching the proverbial pot of water waiting to boil. But after a period of low organic engagement on the page post, I’ll share the post from the page onto my personal profile. Usually within minutes I see 5-10 times the engagement. The point is that IF you decide to use a brand page, it’s re-sharing your content to your personal profile that will drive the greatest organic reach. And if you can get a few other people to share it as well, then your organic reach expands exponentially. I always, always, always advise people to follow the data. Don’t base decisions for how to manage your Facebook presence on emotion, feelings, what someone said works for them, and what some “guru” said you should do. Even if it worked for someone else, it doesn’t mean that it’ll work for you. One of the strengths of brand pages is the Insights tool. It’ll give you a wealth of information about your audience, and how they’re engaging (or not engaging) with your content. You can even find out when your fans are online (which should give you a good idea of when to post). So it’s a good idea to review your page Insights on a regular basis (maybe once every week or two), and ask yourself how you think you need to revise your strategy based on what you’re seeing there. Unfortunately, personal profiles don’t have the same Insights tools. That’s why I like to use a tool like Buffer to post content that I want to measure. 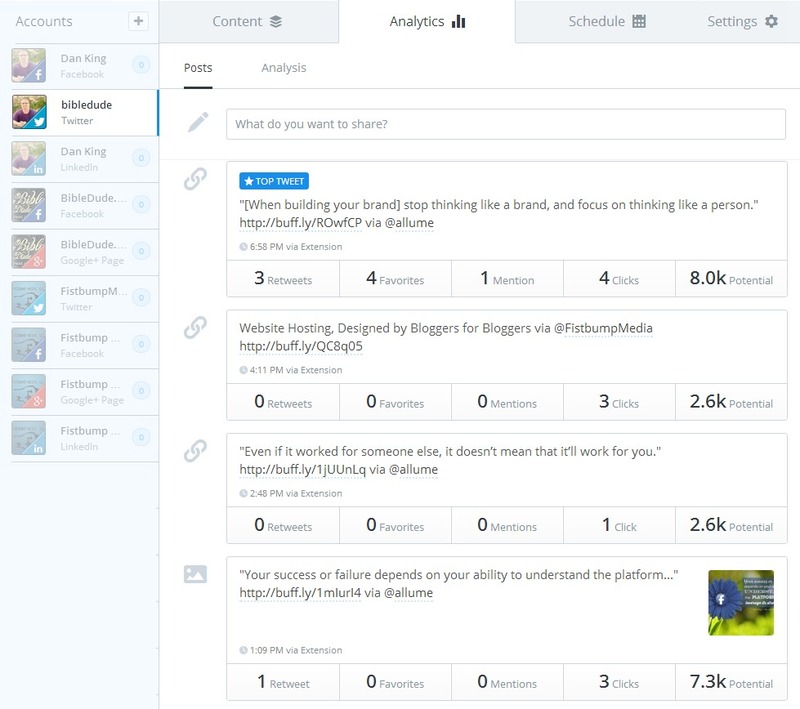 Buffer uses special tracking measures that give us better insight into what’s working and what’s not. In addition to that, it makes it easy to schedule content for specific and/or set times which help you take advantage of waves and cycles of visibility. Facebook presents us with a tremendous opportunity to engage and connect with people, and to share ideas. And when it comes to building your brand on Facebook, you should stop thinking like a brand, and focus on thinking like a person. Note: This post was originally published on the Allume Blog. If blogging had a secret sauce or magic potion, this would be it. By far, this is the most common question I get asked about blogging and social media. 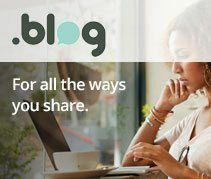 When is right time to share blog posts on social media? I’ll be honest. I really wish I could tell you an exact formula for sharing your (amazing) blog posts so they reach the millions of people who need to be reading them. But the reality is that there isn’t a formula. With that said, there are some things you can do that’ll help you figure it out. With a little bit of testing, measuring, and retesting, you’ll find the right answer for you pretty quickly. 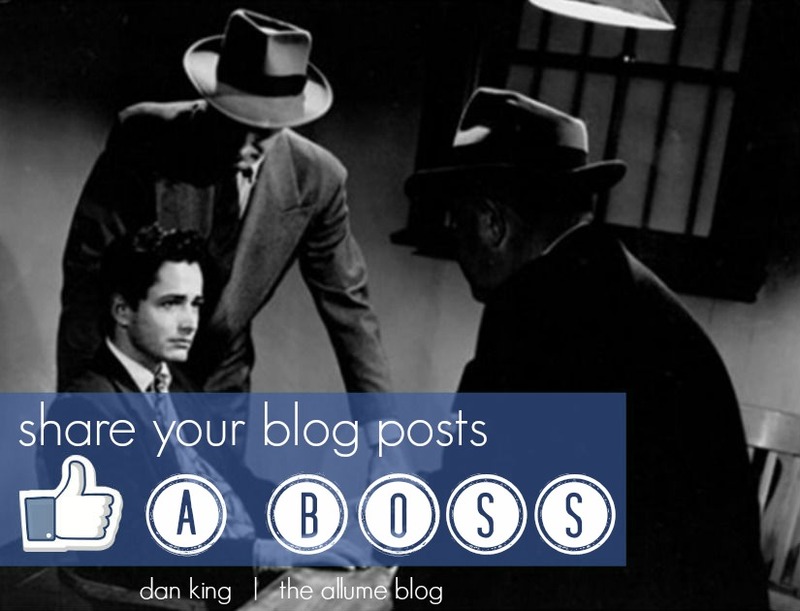 In no time at all, you’ll be able to share blog posts like a boss. 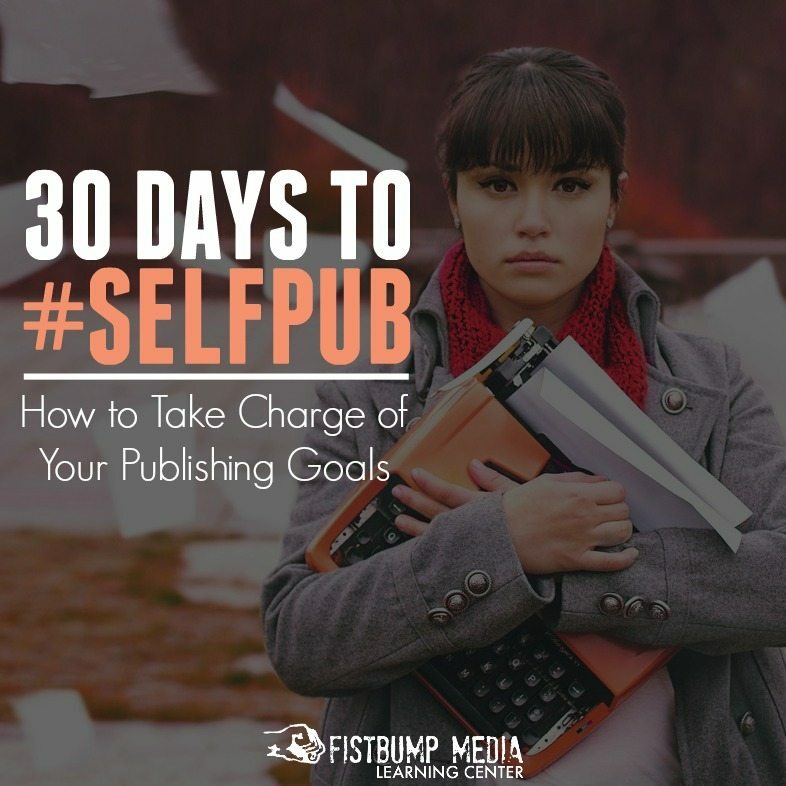 First and foremost, the success of your blog posts in the world of social media has nothing to do with you. Well, maybe a little bit. Many bloggers misunderstand social media success as having to do with getting the right mix with when and how they post their content. However, if it only depended on your sharing, then it’s not really social is it? Create content that’s share-worthy. Think about blog post titles that make readers want to click. Think about eye-popping images that catch their attention. Think about writing content that would make them want to share with their friends because of how it moved them. Make it easy for them to share. I’m amazed at how many websites I visit where I can’t find social sharingbuttons. Sure, I could copy/paste the blog post URL, but if I have to go to that much effort, you’ve already lost me. Share buttons should be highly visible and easy to use. While most of your success comes from how other people share your content, you’ll still want to optimize how you share your blog posts for maixmum reach. This is where you’ll want to experiment with different types of posts (text, images, links, and videos) at different times of day. Social media gurus will look at the data and tell you that you should be posting your content at 2pm on Thursday afternoons (or some other flavor of the month). However, that’s based on meta-data from thousands of accounts, not your data. So how do you find the optimum times for your accounts? 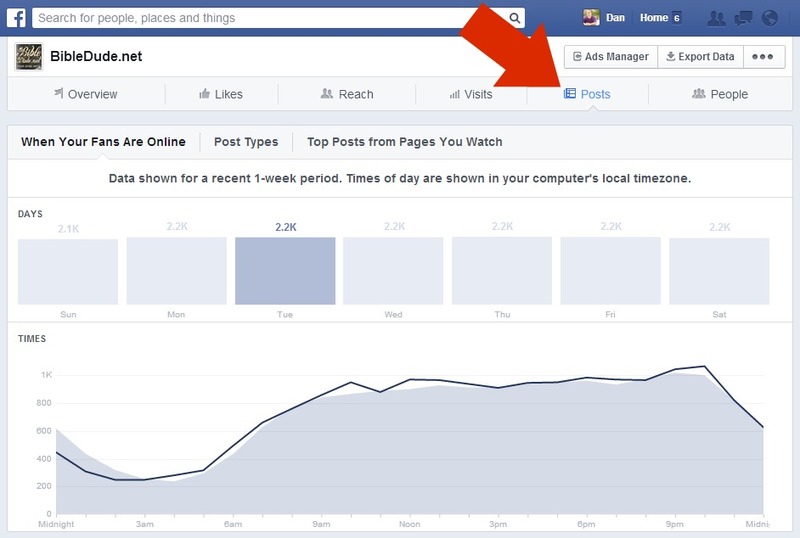 If you run a Facebook page for your website, then you’ll have access to Insights for your page. In your Insights, you’ll find “When Your Fans Are Online” on the Posts tab. 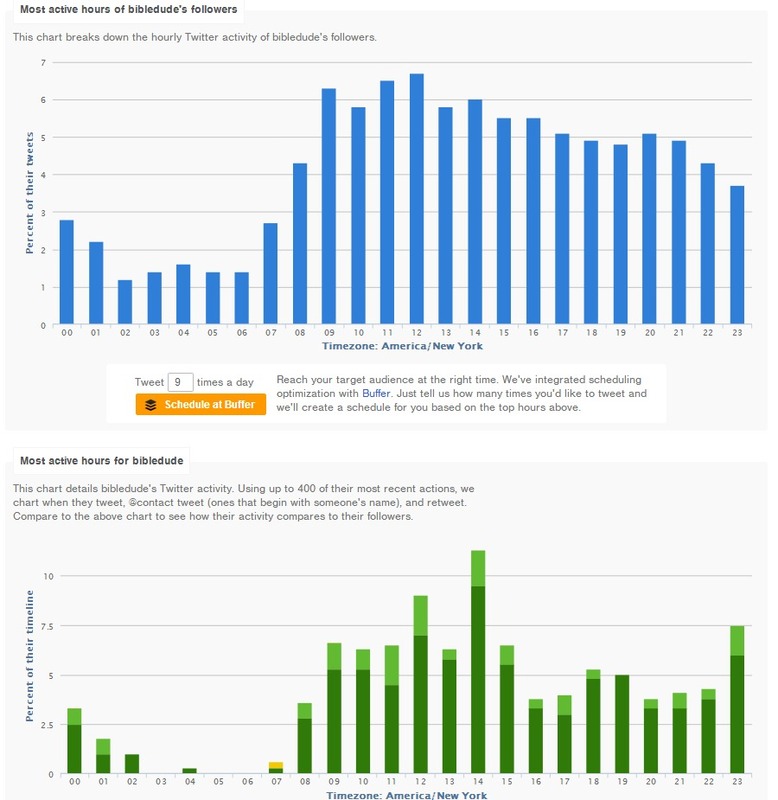 The initial chart shows general population volume, but when you mouse over different days of the week you’ll see when your fans are online that day. This is based on recent data specific to the people who are fans of your page. Note that when your followers are online will vary from day to day. You can find similar data for Twitter using third-party tools, like Follwerwonk. Once you sign in with your Twitter account, you’ll be able to analyze followers… both those who follow you, and those who you follow. You’ll get a great deal of demographic information about your followers, and a detailed chart of when they are most active on Twitter. Once you’ve figured out the best times to schedule your posts, then you can plug that information into a tool like Buffer. In Buffer you’ll be able to create a custom schedule for each of your social media profiles, and set the times you want to post. You can even schedule different frequency and posting times for each day of the week. In the example below, you’ll see that I set my schedule to reflect the peak times for my Facebook page on Tuesdays. This is where that “Schedule at Buffer” button in Followerwonk comes in handy. You can select a frequency for scheduled posts in a day, and automatically import an optimum posting schedule into Buffer. One of my favorite parts of Buffer is the analytics for the posts you share (only through Buffer). Based on interaction threshholds, you’ll get a good idea of what kinds of social media posts are resonating the most with your audience. It’s important to note here that using Buffer for scheduled posts doesn’t mean that everything you do on social media needs to be scheduled through Buffer. It is, however, a great tool that will help you push your blog posts out to different platforms at predetermined times, making sharing much simpler. If your blog is on (self-hosted) WordPress, then you can use some cool tools like CoSchedule. This WordPress plugin comes with a small monthly fee, but it has some pretty slick scheduling functionality. Basically, while you in your Edit Post mode, you can also create your social media posts to publish at whatever times you specify. Create, text, image, and link posts to run at the same time that your blog posts publishes. And then run a different kind of social media post at x-number of hours after the blog post publishes. If you publish your blog post at 6am, you can publish a link post to Facebook at 6am, then an image post 5 hours later, and a text post 10 hours later. Then think about the Twitter and Google+ posts you want to send out in order to get the best coverage for when your followers are most likely to see it. Everything is triggered automatically based on the publishing of the blog post. 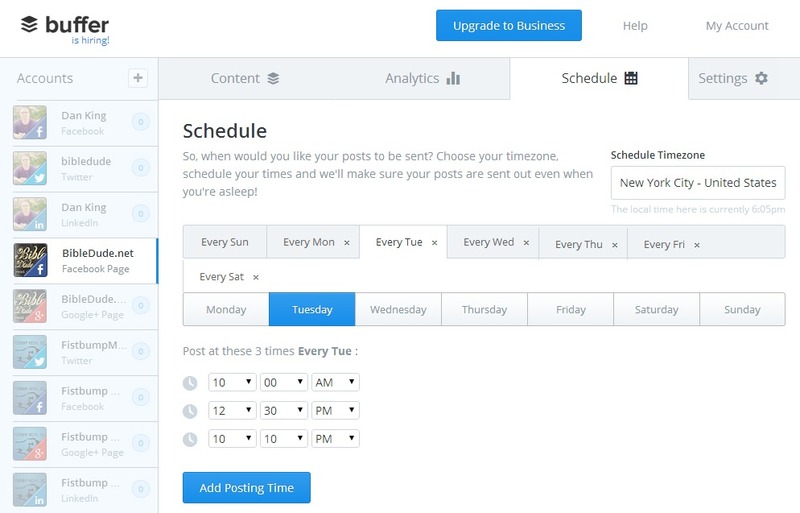 CoSchedule even has a slick calendar that shows you all scheduled blog and social media posts for easy management. Which is easier? Adding 5,000 followers, or getting 10 who have 500 followers to share your work? I regularly tell clients that it’s more important to enable and get other people to share your content than it is to build a massive following yourself. In fact, your social media following will inevitably grow if you are effectively getting other people to share your stuff. And before I get into the practices I suggest for social sharing, it’s worth stating that the first thing you need to do is to create something worth sharing. Your content must be strong if you expect other people to put in front of the people they know. It shouldn’t be something that only tells your story, but also connects with their story. The more people can relate to your experience and say resoundingly, “Yes! That’s me too!”, the more likely they are to share across their networks. The first thing you should be thinking about is how you make social sharing easy for your readers. 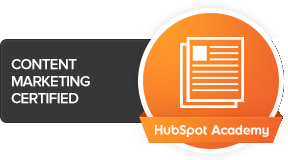 Typically, every action you require a visitor on your website to take in order to accomplish something, the more likely they are to drop off somewhere in the process. 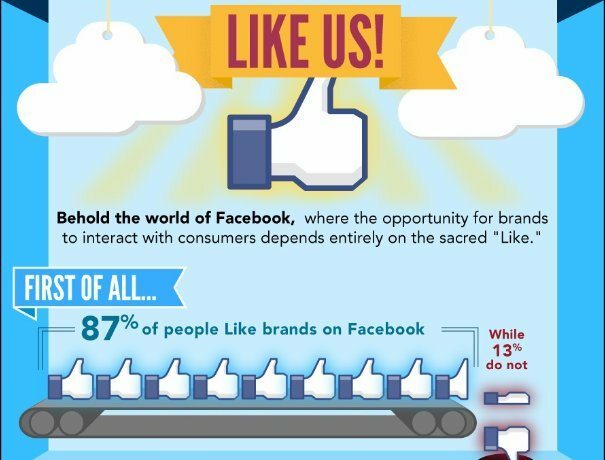 Several studies have shown that social like/share buttons at the top of a post get more clicks than the ones at the bottom of a post. Some visitors will visit the page, and because they like you and or your topic in general, they’ll click that button before even reading the rest of the post (an extra action required in order to get to the same buttons at the bottom of the page). Using the same thinking, floating sidebar buttons tend to get more engagement because they’re always visible, no matter where the reader is. So whenever they decide they like it, and the urge hits them to share, they don’t need to go anywhere else to find how to share. The option is simply always there. With your social sharing options, you’ll want to make sure you’re offering sharing options for most popular networks, even if you aren’t on them. The idea of social sharing is more about enabling people to share where they want, not just where you are. Think about who your typical reader is, and where they may have profiles. There are several great plugins for implementing a floating sidebar for social sharing, and our favorite is Monarch from Elegant Themes. The reason we like this one so much is because of the flexibility in design, and the built-in sharing metrics. What I’m talking about here is more than simply having a nice-looking image on your post. Instead, think about your images as an additional stand-alone piece of micro-content. Create quote images or other stylized images that people will want to share. Think about whether an image has value outside your post if someone were to see it on Pinterest, for example. 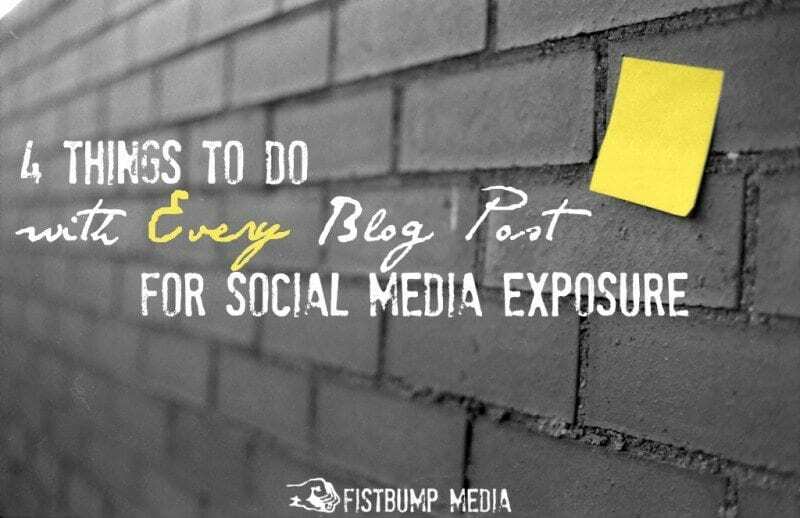 Ideally, once it’s shared by someone to Pinterest (or anywhere else), it’ll be linked back to your website. But the image can take on a life of its own if it is good content by itself, reaching far more people that you might expect. 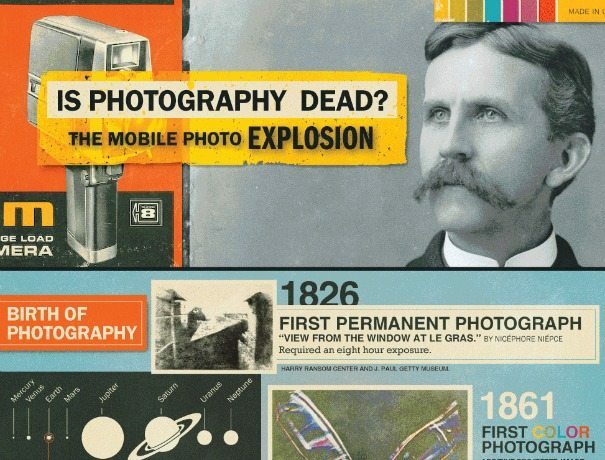 Use tools like PicMonkey or Canva to create amazing graphics to share on your posts. And every post should have an image. No exceptions. Another piece of micro-content which should be included in every post is pre-made tweets. These click-to-tweets empower your readers to share key ideas from your posts with a single click. Additionally, when you use a plugin like Click To Tweet (linked below), it also creates a nice visual break in your content, making it easier for your reader to scan for key ideas. So think about what might be some of the biggest, most important ideas from your post, and turn those into click-to-tweets. Having other people sharing tidbits of your wisdom is a great way to establish greater credibility regarding the topic you write about. And having it ready for them means fewer steps to share those ideas (again, making it more likely that it will get shared). Once you find a posting schedule that works for you with the networks you are on, and enable others to share your content (and micro-content) on a regular basis, then you’ll be well on your way to maximizing your social reach with every post. Photo by Sarah Joy, used via Creative Commons from Flickr. Image design by Fistbump Media, LLC. I just jumped in blindly when I started blogging seven years ago. I had experience with web development and writing training programs, but the fine art of writing for readers was a new experience for me. I knew nothing about finding (and keeping) an audience captive and growing a platform as a (real) writer. There was a great deal of networking and studying the craft and technology of blogging that I had to get done. As a result, I owe practically everything I know about blogging to someone else somewhere along the way. Even today, as blogging continues to evolve, I continue to find myself studying, testing, and experimenting with new tools and tactics. Over the years, I’ve published somewhere around half a million words of content on the blog, two books (with half a dozen more in development now), and countless social media posts that communicate a message that I never find myself at a loss of words to talk about. And, I couldn’t be more grateful for all of the people who have helped me get to where I am today. So when I started Fistbump Media in the last year, one of the most important ideals I wanted to drive what we’re all about is this concept of being helpful… being a resource for others who are trying to do the same things that I’ve been able to accomplish. That’s why we do free webinars and Q+A sessions. That’s why I answer questions and help others, even if it means that I don’t get paid for it sometimes. We believe it’s important that we (as a community of bloggers) support each other, and help each other reach our goals. As it turns out, this position of simply being helpful has helped us create some very positive buzz about what we do. My heart honestly skips a beat every time I see another message come through from someone who learned something in one of our events and improved their blogging platform! We also believe that these success stories can be encouraging to others who are going through the same thing. So we’ve asked some of the people who we’ve helped to share a little bit about how they’ve experienced growth/success on their blogs. I hope that these experiences encourage you to take the next step with your blogging, and encourage you that together we can grow and sharpen our skills. If you’ve learned and applied something as a result of a Fistbump Media event, then please share your success stories here! And if you haven’t, then I hope you find strength and encouragement in these stories. You can do it too! I’ve done quite a bit of traveling outside the country over the last few years. And you’d say that I was a fool if I told you that I didn’t have a camera on me for any of those trips. Could you image being 10 yards away from a real, live lion in the wild in Africa and not getting a picture of it?